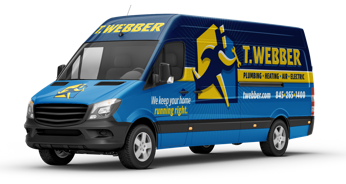 Wiring & Rewiring Services - T.Webber Plumbing, Heating, Air & Electric. Rewiring Aluminum Wiring with Copper Wire Aluminum wiring, used in many homes from the mid-60s to early 70’s is a potential fire hazard. Problems due to expansion can cause overheating at connections between the wires and devices (switches and outlets) or at splices. CPSC research shows that homes wired with aluminum wire manufactured before 1972 are 55x more likely to have one or more connections reach “Fire Hazard Conditions” than are homes wired with copper. Removing Knob and Tube Wiring and Replacing with Modern Wiring Older homes built in the late 1800’s to early 1940’s often have what is known as ‘knob and tube’ wiring. This wiring system is ungrounded which makes it extremely dangerous and prevents the service of any three-pronged outlets or appliances. Now obsolete, if your home still has knob and tube wiring it should be upgraded to modern copper wiring to prevent any fire or health hazards. The Hudson Valley is home to many beautiful older buildings – filled with character and history. However, if you live in a “well loved” home be sure your home’s electrical system is safe and up to current electrical code. Our expert Hudson Valley electricians can review your home and make recommendations for modernizing and safeguarding your electrical system. Our team of expert Electrical Contractors is fully licensed and insured, and experts in their field.